When BMW debuted its first plug-in hybrid sports car, the i8, in 2014, it got some thinking if the marque had plans to revive one of its discontinued models that bore the same number—the 8 Series coupe, which was in production from 1990 to 1999, before it was set aside due to poor sales. Those thoughts were answered when BMW announced that it will be unveiling the concept for its reborn 8 Series Coupe at the prestigious Concorso d'Eleganza Villa d'Este in 2017—an interesting choice of event, where the concept’s ultra-modern form starkly contrasted with the voluptuous bodies of the classic cars that were also being showcased. Fast forward to this month, the first production model of the 8 Series Coupe—the M850i xDrive Coupe—arrives on Singapore shores, and is the marque’s most luxurious sports car to date. The 8 Series Coupe bears a close resemblance to the concept—its exterior is sleek, sculpted yet elegant—except for the designs of certain features, such as the kidney grille and front and tail lights, which have been toned down to look less futuristic and more palatable to the market. It has a low-slung body with a sloping roofline, bulging fenders and an integrated trunk lid spoiler, all of which signal the car’s dynamism on the road. Its designers have also taken a leaf from classic racing cars, weaving into its body a “double-bubble” contouring, as though mimicking the rush of air to the rear along the roof at high speeds. Defining its chiselled rear, fierce-looking L-shaped tail lights stretch to the sides of the car and accentuate its wide, muscular shoulders, while large trapezoidal twin exhaust tailpipes anchor either sides of the lower section. Like the exterior’s modern, emotive design language, the coupe’s interior is stylish and plush, accented by soft leather and electroplated surfaces—it almost feels like one is entering a cocoon on wheels. The design of its wide centre console is practical and not overly complicated, so the driver’s gaze is focused on the road ahead. As per standards, the coupe comes with beautiful sports seats, Harman Kardon surround sound system, a wireless charging feature, and a leather sports steering wheel with multifunction buttons and shift paddles. Incorporating the latest in key technology, the BMW Digital Key allows owners to lock and unlock their 8 Series Coupe using their smartphone, hence cutting out the need for a conventional car key. To open the vehicle, one simply has to hold their smartphone up to the door handle. Inside, the engine can be started once the phone is placed in the wireless charging unit or smartphone tray. The Digital Key can be shared with up to five other users. 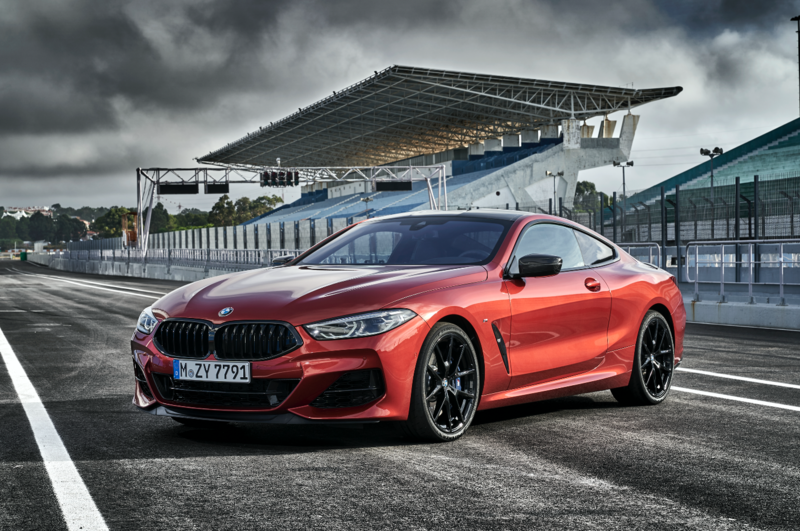 The M850i xDrive Coupe features a new 4.4L V8 twin-turbocharged engine that delivers incredible power—530hp and 750Nm of torque to be exact. Complemented by the latest eight-speed Steptronic transmission, the car is capable of accelerating from 0 to 100km/h in just 3.7sec and hitting a top speed of 250km/h. Throughout, the car remains agile and assured, thanks to the BMW xDrive intelligent all-wheel-drive system, which distributes drive torque between the front and rear wheels according to the road situation so as to ensure maximum traction and handling stability. The coupe was also designed to take long, relaxing cruises. Simply choose from the different drive modes—Eco Pro, Comfort, Sport and Sport+—and the car will adapt and respond according to your fancy. In Sport or Sport+ mode, for instance, the Adaptive M suspension stiffens and there is more direct steering response, heightening the car’s dynamic driving style.